There is also an Alton Brown recipe for these that looks promising, but I haven't yet tested it. But this one, this one is easy, fast, and VERY authentic with the inclusion of a boiling in water and baking soda prior to baking. I encourage you to try this, if you don't already make pretzels. If I can do it...well, you know the rest. Add yeast and sugar or honey to warm water; let sit 5 minutes to allow yeast to get foamy. Punch down dough and divide it into 12 equally-sized pieces, and roll each piece into a ball (dust hands with flour to prevent sticking). Place balls on a cookie sheet or lightly floured surface. Cover lightly and rise for 15 minutes or so. Don't crowd them together on a plate like I did--it's not a disaster when they stick together, but it is a pain. Roll each ball into a 16-inch length (make a snake!) and form into a pretzel shape. Or, divide each ball in half and roll each half into a 3-inch stick, about 3/4-inch wide. Let rest a few minutes so they can "fluff up" a bit. Meanwhile, preheat oven to 475°F. Grease, or spray with cooking spray, a large cookie sheet. In a non-aluminum pot, bring remaining 4 cups water to a boil with baking soda. 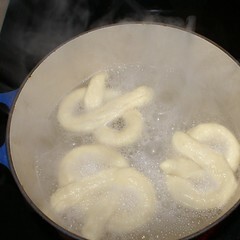 Add pretzels to the boiling water in batches (do not crowd) and boil 1 minute each, turning once. Scoop pretzels out with a slotted spoon, allowing excess water to drip through. 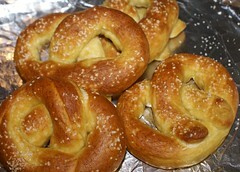 Place pretzels on cookie sheet and sprinkle with kosher salt or other desired toppings. Bake 10 minutes, until golden brown. Makes 12 large pretzels or 24 sticks. These yummy snacks are DEFINITELY best eaten right out of the oven, BUT, if you want to make a larger batch and store some, LEAVE OFF THE SALT or other toppings before baking. Bake them plain, and allow to cool COMPLETELY. Once the pretzels are TOTALLY cooled, place them into the freezer on an uncovered cookie sheet for flash-freezing. Once they're frozen solid (an hour or so--do NOT forget and leave them there overnight), place them into freezer bags for storage. When it's time to prepare one for a snack, take it out of the freezer, and place onto a paper towel. Have your desired topping, salt, cinnamon sugar, whatever, ready to use, and working QUICKLY, one pretzel at a time, dip your finger into some water and brush the water over the tops of the frozen pretzels. Before the water can dry (seriously, work fast), sprinkle on the toppings. Then heat in the microwave in short bursts until pretzels are warm and soft. They'll be almost as good as when they were fresh from the oven. My friend Erin informed me that her grandmother always brushed her pretzels with melted butter, and I have to admit that sounds divine. With the frozen ones, you could probably use the butter instead of water to make your toppings stick, too. That would be especially yummy with the sweet versions, and none too shabby with salt or other savory variations, either! So now you have the straight dope: Go forth and pretzel! YUMMMMM. Why is it so important that the pretzels be boiled in a non-aluminum pot? Would pots with a non-stick coating inside be OK to use? That squishy sound you hear? That's my drool hitting the floor! I am SO making these with Theya!! These are so easy and yummy, and infinitely customizable. The non-reactive pot is a must because of the baking soda, which changes the pH level of the boiling water. Kind of like how you're not supposed to cook tomatoes and other acidic foods in cast-iron. You can't use aluminum in the previous (cheese) recipe, either. Plus, personal bugaboo of mine--you don't really want aluminum leaching into your food in tiny amounts every time you cook. But yeah, I'd think a non-stick coating would be fine. I use cast-iron pots that are enamel-coated. Oh Belinda, I loooooove you for this! I'm having a "learn to bake my own bread" weekend, so I'm going to add this recipe to the agenda. Cinnamon sugar sounds like the perfect topping for my brood. I will be asking Ian to make these today - it'll transport me right back to grandma's kitchen! Thanks for posting it. They sound DIVINE. For cinnamon/sugar topping, I would probably brush them with melted butter and then sprinkle the cinnamon/sugar on top. Came here from Mir;s site, and reading through some of your past posts you mentioned powdered peanut butter. How'd that taste/work out? This sounds so yummy! I too, found your site through Mir's and have enjoyed looking over your happenings. I even ordered the easy cheesey kit and am impatiently awaiting its arrival! Thanks for taking time to post pics and hints! I Am Not An Expert. In ANYTHING. I'm not a great cook, a great housekeeper, a great planner, and most definitely not a great organizer. This journal is where I'll keep track of my efforts at improving in these areas, and I welcome you to join me, and especially welcome your comments and suggestions. 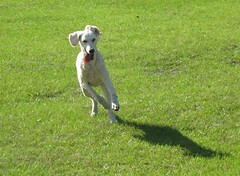 What I'm going for here is some accountability, as I try, at long last, and every day, to GET IT TOGETHER, STARTING NOW. The Best Thing You Ever Did For Your Sinuses: THE NETI POT! Fried Green Tomatoes. Yes, They're That Good.